Let’s talk chunky sweaters everybody – because the temperatures made us to take them out of the closet. You won’t believe, but chunky big sweaters are one of the most stylish winter pieces. After all, in 2017 we made huge progress in ditching painful trends, so from now on is all about coziness. For too long women sacrificed their comfort to look on point, but chunky sweaters are here to turn you into a style icon while feeling cozy. So, let’s start with all the good reasons to stock on these this winter. No need to say that a knitted chunky sweater or cardigan is the warmest clothing item you could get. But there is something else that makes these pieces so irresistible. Chunky sweaters and cardigans add dimension to your look. It’s like saying “Hey I am here, look at me!” with your clothes. You would usually try to say something like this with vibrant colors and prints, but that’s not necessary with chunky garments. These big and almost fluffy wonders get all the attention just because. Style bloggers’ favorites are the ones with puffy sleeves that look insanely stylish. These chunky sweaters and cardigans are so warm that you could wear them as an alternative to jackets or coats. To be honest is a bit hard to throw another outwear piece over these because the sleeves are enormous. Anyway, if you layer wisely, you won’t need one. Plus, these chunky cardigans will teach you the art of layering. You can wear them over anything but for the sake of chicness pair these with dresses or a corduroy suit. If you haven’t heard by now, corduroy is the new winter It fabric, so why not nail two trends with one outfit? The chunky sweaters, on the other hand, look the best when combined with skirts. Go chic and mini with metallic one or keep yourself warm with a midaxi or maxi skirt. It’s easier to pull off these combos than you think. The moment you feel the warmth and coziness of the chunky sweater you’ll forget all your fashion fears. Don’t forget to add flare pants to your closet because this is the pant that took over the streets this season. Oversized chunky sweater on loose flare pants – you can’t get more comfortable (and stylish) than that. 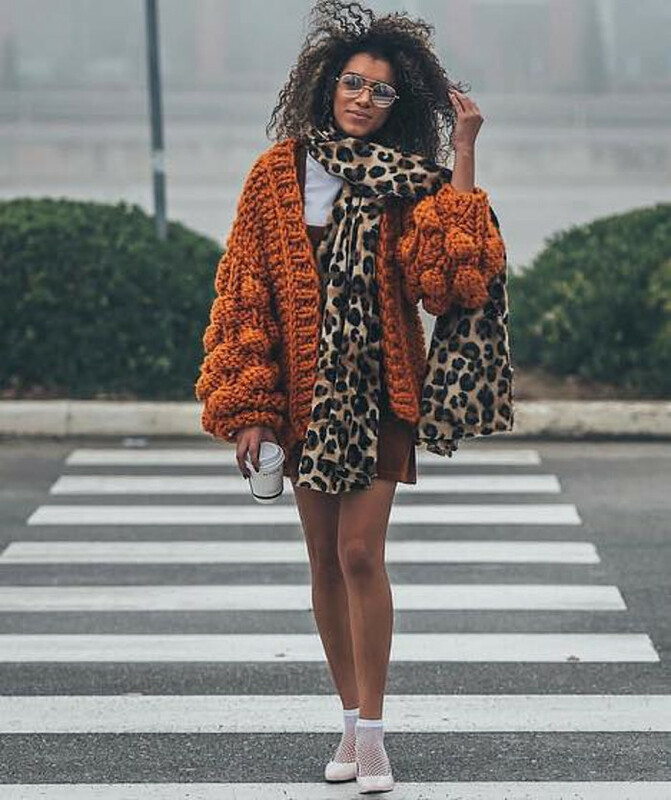 Feast your eyes on these outfits that involve chunky sweaters and cardigans and get ready to channel your inner style blogger. Chunky cardigans are big enough that everybody notices even those in neutral colors. But if you don’t want to take any chances get yourself one in burned orange and just enjoy the attention you’re getting.